Regardless of what industry you cater to, your event marketing efforts need to stand out to attendees. With all the competition these days, it’s difficult to get your event on their radar, but by learning from some of Fourth Wall Event’s favorite experimental marketing efforts from over the years, we can start collaborating on some unique ideas of your very own. The Simpsons Movie came out eight years ago, but its amazing marketing efforts live on today. 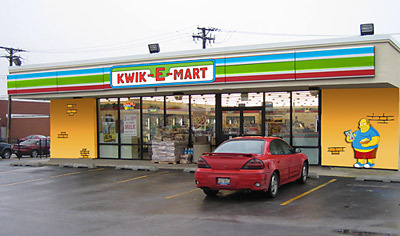 20th Century Fox partnered with 7-Eleven to make the show’s Kwik-E Mart a reality. Dozens of 7-Elevens across the country were transformed and familiar treats from the show, like pink sprinkled donuts, Buzz Cola, and Krusty-Os cereal, were available for purchase. You probably remember this one. Our palms still get sweaty just thinking about it! In 2012, Red Bull went to the absolute extreme in collaboration with Felix Baumgartner when he accomplished a record-setting skydive from 24 miles above the Earth. The marketing stunt – Stratos– had our adrenaline pumping so hard, we felt like we just drank an entire six-pack of Red Bull. The online shoe giant recently performed one of our favorite marketing efforts at Houston George Bush International Airport the day before Thanksgiving – arguably the most miserable travel day of the year. Zappos turned a baggage carousel into a massive “Wheel of Fortune”-style game that awarded passengers with prizes based on where their luggage landed. Check out the awesome video! These three initiatives serve as serious inspiration for event marketing efforts, and the team at Fourth Wall Events is always on the lookout for the latest and greatest ideas. Partner with us today and we’ll help you plan and execute event marketing efforts that are guaranteed to wow attendees.